Simple tasks can be excruciating for someone with arthritis. Instead of thinking of moving away from a home filled with obstacles, think about improving what’s already there. Follow these tips to make life living with arthritis easier. Photo courtesy of Brady Architectural Photography. Remodeling the kitchen is one of the best investments for improving your quality of life. How equipment is stored is a key to making cooking less painful. Converting cupboards into sliding drawers will make it less difficult to get items when you need them. Put heavy items close to the front of the cabinet and store utensils and cookware so they’re easy to reach. When looking at appliances, invest in ones with levers that are raised higher and that are easy to use. The bathroom can be a difficult area to use if it is not equipped for someone with arthritis. 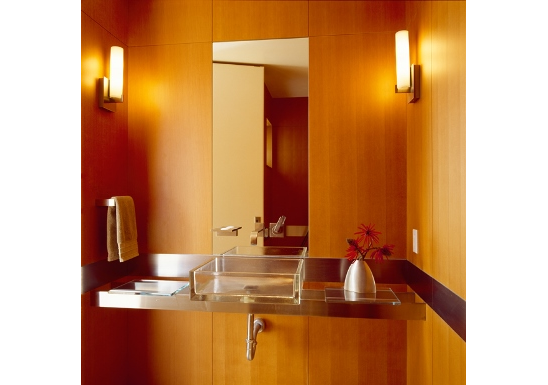 You can install foot pedal faucet controls, grab rails, hand-held showers, toilet lever taps and spatula handles to make the bathroom easier and less painful to navigate. A level access shower will also make it easier to get in and out of. Make sure to keep toiletries in an area that is easy to get to and consider installing automatic dispensers for soap, shampoo and conditioner. A night of poor sleep will lead to stiffer joints and more pain. For this reason, you’ll want to make some adjustments to the bedroom. Mattresses, pillows and pads that adjust to the body are very popular for people with arthritis. There are also mattresses that allow you to control the firmness. It’s a good idea to have lighter blankets on the bed that are easy to take on and off. Heat soothes joint pain, so keeping an electric blanket or pad nearby could be beneficial as well. You’ll want your room to be easy to maneuver. Make sure the bed is at the right level to access easily. Place a chair within easy reach of the bed; this can make it easier to get dressed. For more sleep tips, see How to Make a Sleep Friendly Bedroom. Installing a handrail or even a second handrail on stairways can be essential for more safety and less pain. You will want them to be designed so they are easy to grip. Also, making sure sure the carpet is not loose and is secure will make it safer to negotiate stairs. If the arthritis is extremely severe, you could consider investing in an electric stair lift chair or home elevator. Lowering light switches, putting in touch-sensitive lamps or installing motion-sensitive lighting will be helpful for anyone finding it difficult to reach switches and turn on lights. You can also contact manufacturers to see if they offer alternative controls that would be easier to use on any heating or lighting systems. Make sure hallways are not cluttered and are well lit. If a walker or assistive device will be used, you will also want them to be wide enough to negotiate easily. Cushions that have been worn down can be replaced on couches to make them more comfortable and easier use. Adding risers to different chairs and couches can also make them more accessible for people who suffer arthritis pain. It’s important to arrange furniture so it is easy to get through and around. I am in fact happy to glance at this website posts which contains plenty of valuable data, thanks for providing these kinds of information.